"Fulgensia Fulgens" , A soil Lichen with a thin crust-like egg-yellow body (thallus) which consists of smaller rosettes and paler blotches and looks like scrambled eggs. When well developed the thallus has scattered, rounded, dark orange fruits up to 1.5 mm. 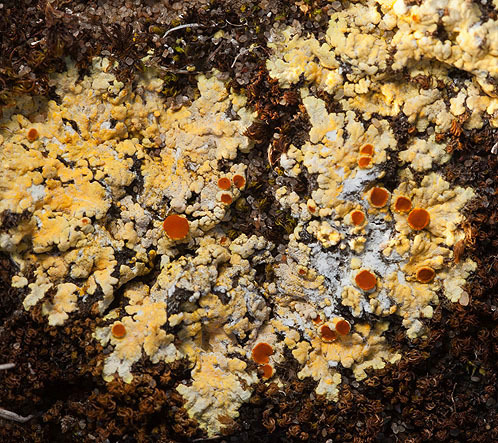 The lichen was photographed near Sandy Pit - Stackpole Warren, and is very small - the size of a 1 penny coin.